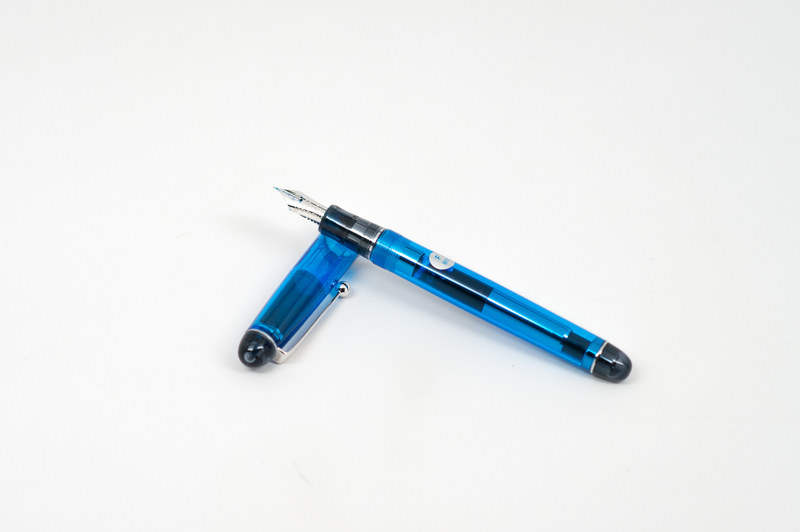 Description: A nicely balanced demonstrator at a reasonable price with a great 14k gold nib. Color Options: Blue, Clear, Orange, Purple, Smoke – See them here! I’ve been interested in the Custom 74 for quite some time now. The $150(ish) price range has a ton of options, and it’s always good to try out another pen in the range. I feel as though $150 is the middle ground in the fountain pen world and some of the best pens are around that price. 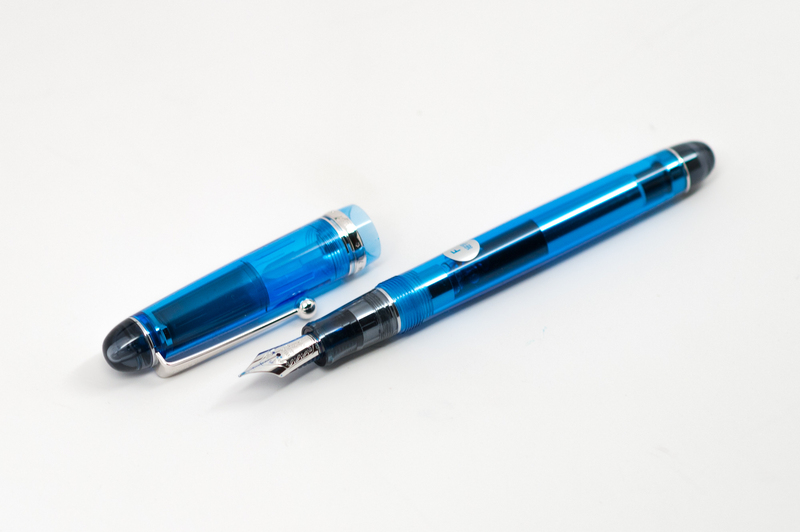 I have a Custom 823 with an architect grind that cost around double the 74, so I was very happy to check its little sibling out when Pen Chalet offered one up for review. The Custom 74 is a gold-nibbed demonstrator style fountain pen that fills via Pilot’s high quality pump converter – the CON70. 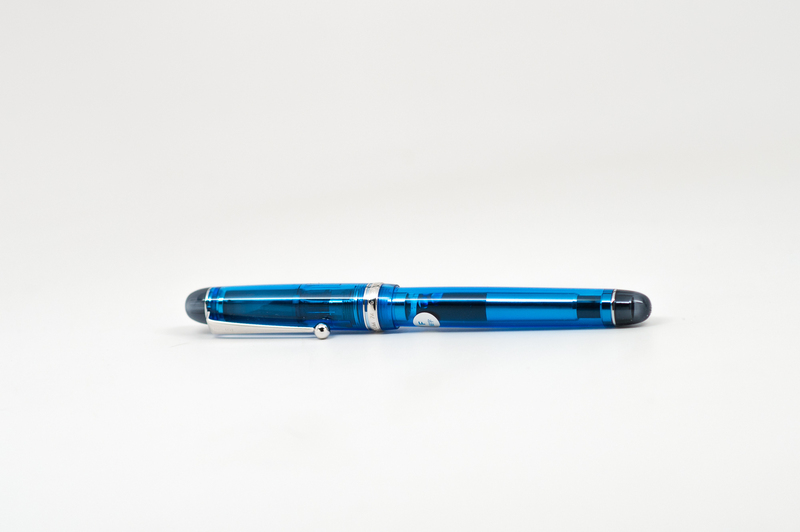 The pen is a great looking work horse, and at $160 it makes a great entry into the mid-level price tier. Huge thanks to Ron at Pen Chalet for sending me a Pilot Custom Heritage 74 over for review. I’ve had the Custom 823 for a while now (and love it), and I am happy to report that the Custom 74 is just as great! The Custom 74’s packaging leaves something to be desired for those who want a really nice presentation. It’s a cheaply-made box with a viewing window in it, displaying the pen. It’s not nearly as ornate as the fabric-lined box that came with my Custom 823, but it gets the job done. Personally, I file away packaging should I want to sell the pen so the smaller, the better. The pen itself looks great. The translucent blue resin has a smoke-colored grip and tail cap. 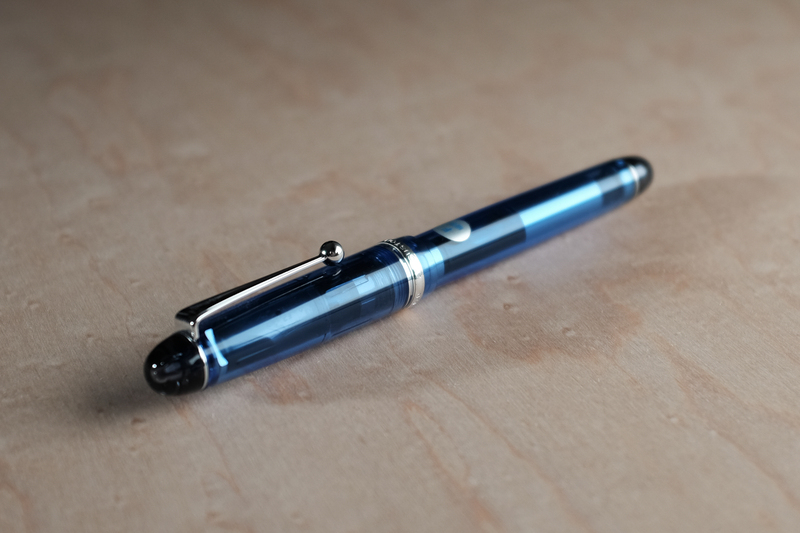 The silver trim nicely compliments the rest of the pen. The clear body allows you to see the premium CON-70 converter inside which has nice chrome accents. 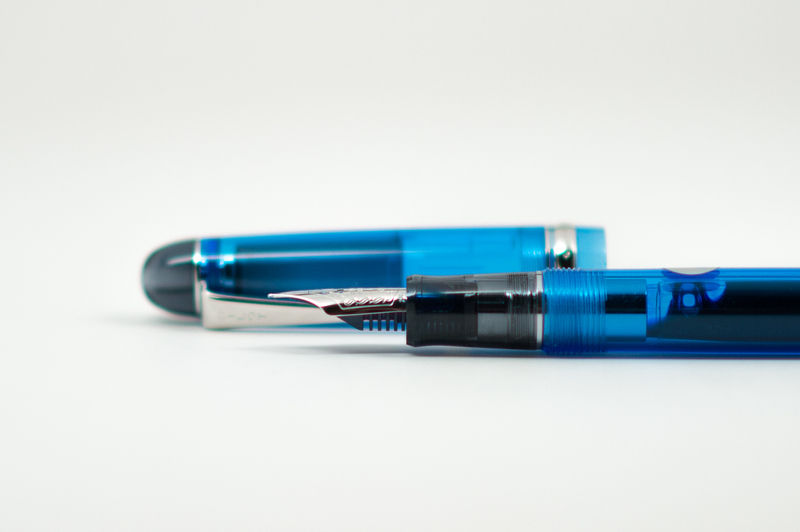 The large chrome portion of the converter adds a nice pop to the pen, better showing off the brilliant blue color of the pen. Overall, it’s a classically inspired design that looks great. I opted for a fine nib on my Custom 74. Being Japanese, the nibs tend to run a size finer than Western Pens. The fine nib on this pen is very, very fine. It has a fair amount of feedback, but it’s not scratchy or annoying. The ink flow is generous and consistent. If you push the gold nib a bit, there’s some nice cushion. 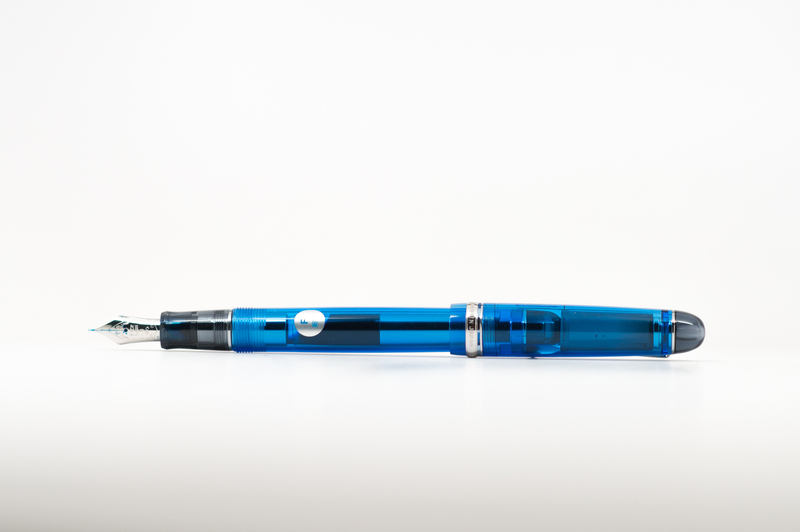 It is by no means a flex pen, and line variation is slim-to-none. The pen will put down more ink when pushed slightly harder though. I actually prefer to write with a little more pressure with this pen. Ink flow, as mentioned before is pretty much middle ground. Even though the line it lays down is very fine, you can still see some shading. Overall, I’m happy with how it writes. Especially the fact that the fine nib can be used on cheaper paper due to its fine-ness. As for filling, the CON-70 is a pump style converter that holds a fair amount of ink. It feels substantial and adds a nice amount of weight to the pen. Considering it is inside the pen, it adds a great balance. 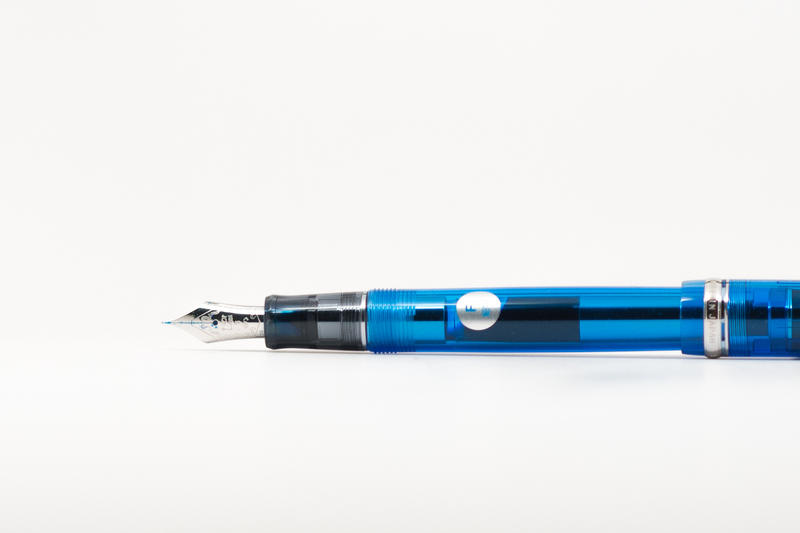 To fill the CON-70, you submerge the nib into the ink, and repeatedly press the button on top of the converter. The ink draws up easily and quickly. It’s reminiscent of how the old Parker Vacumatics fill with a button. The Custom 74 is nicely sized. It’s a perfect medium – nicely weighted and nicely sized. The plastic is high quality and I have no worries of the pen cracking. The injection molding is nicely finished too. There are no visible seams and the construction and fit of the parts are all top-notch. The pen really feels like it is worth the price. I think Pilot consistently nails it in quality and construction of their pens, from the $5 Metropolitan to the near-$400 Custom 823. The 74 fits nicely in the middle. The cap is capable of posting, but it makes the pen a bit too long for my liking. The pen practically disappears in hand. I definitely like how it feels. The Custom 74 is a solid workhorse pen. It’s priced right, at $160. I really like the CON-70 converter – it holds a ton of ink and looks great through the transparent body of the pen. The 14k gold nib lays down a very fine line with a bit of nice feedback. I’ve used the word “middle” a lot in this review, and I feel like it’s been appropriate. The Custom 74 would make a great alternative for those looking at a Lamy 2000 or Vanishing Point, but want something that looks a bit different. In my opinion, it would be just as great of a choice as either pen. You won’t be disappointed if you chose to get one! Thank you for this very informative review, which I enjoyed reading. It looks as if it is a nice pen. My own view is that the US price tag for this pen is a bit too high. Try some of the Japanese sellers on ebay (such as engeika), who may have it for lower prices. Good review Ed. I ended up with two of these through an ‘interesting’ eBay transaction, a fine and a broad. I’m not usually a fine nib person, especially a Japanese fine, but this is one of the few pens that are exactly the right size/shape and grip to tip distance that it works for me [the broad nib also rocks]. I can only agree on all of your comments, especially related to the CON-70 converter which really is more like a mini vacuum pump. It does look great in blue, mine are only the clear ones but they’d be great as a blue/orange pair. Pingback: Just another pen ? !Blick über den Tellerrand vom 10. January 2015 - Just another pen ?! Great review! I prefer pens with flat caps, so I have the Pilot Custom Heritage 91, which is otherwise identical apart from being opaque. It’s a great pen and I have two of that. The 92, which is a piston filler, costs more but is a favourite as well. I enjoy using Japanese fine and extra fine nibs, and my favourite brand is Pilot!